The Specialised Great Britain auction held over two days on April 11-12 achieved an unexpectedly high total of £826,648 with the return of a number of important buyers to the market. Whilst catalogue price adjustments, both upward and downward, are undoubtedly required in some areas, this pleasing overall pattern of results reflects a broad base of support that should provide a sound foundation for future growth in the Great Britain market. Four names dominated this auction, experts in their fields who had each compiled exceptional collections of their area of study. A further offering from the remarkable collection of Dr. Peter Young, FRPSL, included many handsome proofs and essays rarely encountered. 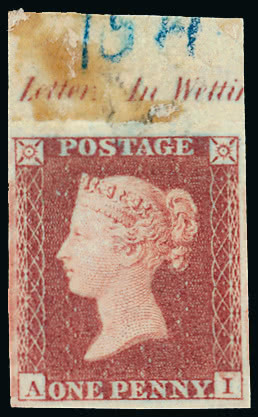 A colour trial for the 1880 4d. (lot 759, above), printed in a particularly appealing combination of blue-green ink on green paper, achieved a well-deserved £5,208. Particular excitement was generated by a unique collection of covers demonstrating the usage of the 1881 1d. lilac (lot 785) which more than doubled its estimate to soar to £10,912. The name of the late Dr. Kenneth W. Statham will be forever connected with the study of the Queen Victoria 1d. red in recognition of his meticulous research and invaluable publications. This may be “the most studied stamp in philately” but its popularity endures. Support for the many individually offered 1841 imprimaturs was solid, plate 154 (lot 481) being a typical example at a price of £645. The arrival of the David Walker collection of King George V Controls to the market was well-timed. Whilst the highest prices were achieved by selections there were also a number of notable results among the individual lots. 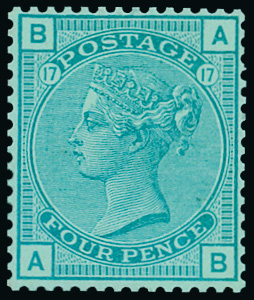 The 1912–24 watermark Royal cypher 4d. pale slate-green (S.G. Spec. 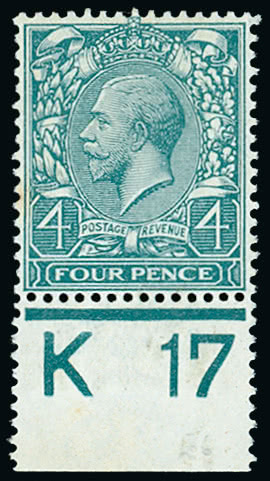 N23(5) with “K 17” control (lot 1160, left) catalogues £2,200, but was pursued to a price of £4,712. The award-winning collection formed by Frans Op den Kamp, FRPSL, contained many mistakes – deliberately. 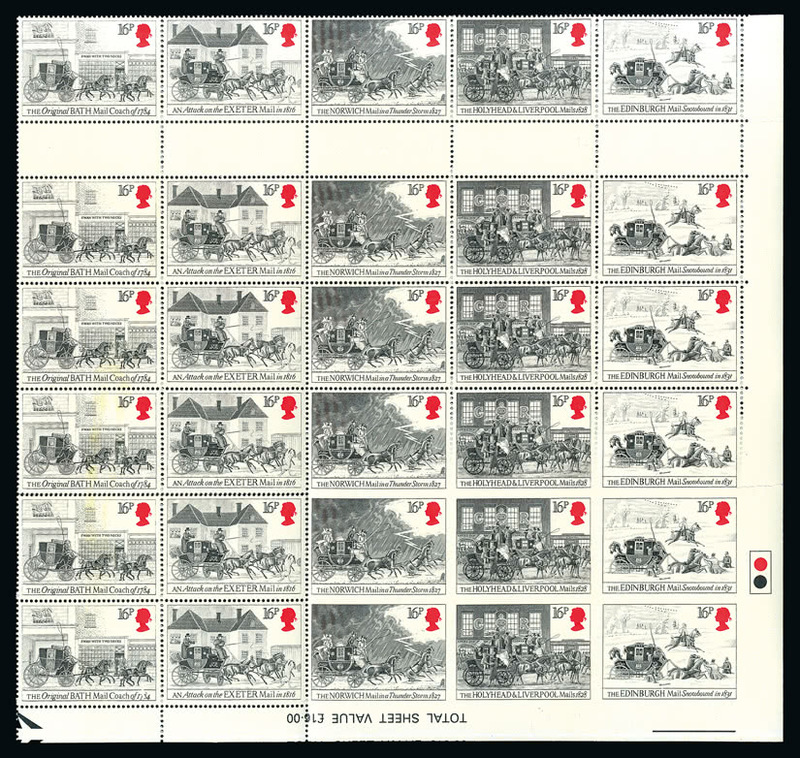 The unmounted mint gutter block of thirty of the 1984 Bicentenary of First Mail Coach Run 16p. (lot 1490) containing two imperforate pairs, with two more imperforate on three sides, is a dramatic and unique item of error philately and well merited its £8,640 realisation. Top prices in this auction were paid for two high value stamps of the 1867-78 Watermark Maltese Cross issue, both rare unused examples that had formerly appeared in the collection of the late Sir Gawaine Baillie. 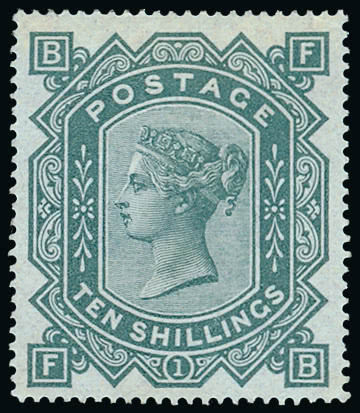 Featured on the front cover of the auction catalogue, the 10s. 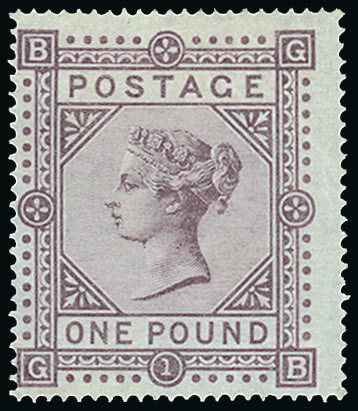 (lot 698) achieved £18,000, the £1 (lot 702) reaching £29,760. The next specialised auction of Great Britain stamps and postal history is to be held at Grosvenor on June 14.